Vodafone, today launched “SUPER WEEKS-4” offers wherein its Postpaid and Prepaid subscribers can Access /surf FREE on Cricket Mobile Site like Yahoo Cricket, ESPN STAR, Cricket Next and CricInfo from their Mobile Phones! Vodafone ‘SUPER WEEKS’ initiative launched on 16th April which is one ticket to 6 weeks of FUN and Frolic! Earlier Vodafone offers “Connect with friends” on entire social networks (Facebook /Twitter/Orkut), Mobile Games for FREE and Free Yahoo and Gmail Access for 1st, 2nd and 3rd week respectively. 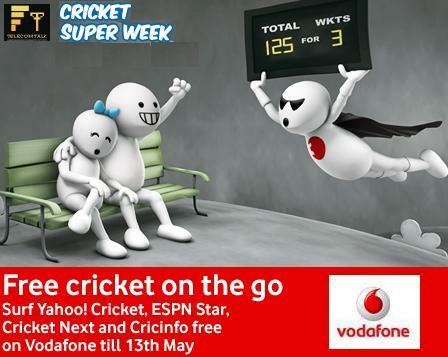 This week all Vodafone customers across all the circles can enjoy Unlimited FREE access to Yahoo Cricket, ESPN Star Cricket, Cricket Next and CrickInfo from their Mobile phone. This offer is only valid for mobile sites only and available for one week (7 Days) from 7th May : 00:00hrs to 13th May: 23:59hrs under CRICKET SUPER WEEK Offers. To avail the offer subscriber needs to send SMS ‘SUPER’ to 111 (toll free). You will get a message with the link to super weeks page – http://m.vodafone.in/superweeks/. On this page, there will be links to the sites which are a part of the cricket super week. We sincerely regret any inconvenience caused. Please share your number with us here at http://bit.ly/l1MCyZ we’ll look into the matter and get in touch with you at the earliest. We sincerely regret the inconvenience faced by you with one of our services / products. We would like to get in touch with you on this. Please share your details at http://bit.ly/mLXIMe and we’d be happy to help.